Saba bananas typically grow to very large sizes. Saba banana is a triploid hybrid (ABB) banana cultivar originating from the Philippines. 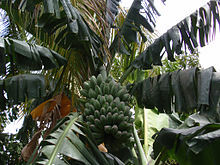 It is primarily a cooking banana, though it can also be eaten raw. It is one of the most important banana varieties in Philippine cuisine. It is also sometimes known as the cardaba banana, though the latter name may be more correctly applied to a very similar cultivar also classified within the saba subgroup. Saba bananas have very large, robust pseudostems that can reach heights of 20 to 30 ft (6.1 to 9.1 m). The trunk can reach diameters of 3 ft (0.91 m). The trunk and leaves are dark blue-green in color. Like all bananas, each pseudostem flowers and bears fruits only once before dying. Each mat bears about eight suckers. The fruits become ready for harvesting 150 to 180 days after flowering, longer than other banana varieties. Each plant has a potential yield of 26 to 38 kg (57 to 84 lb) per bunch. Typically, a bunch has 16 hands, with each hand having 12 to 20 fingers. Saba bananas grow best in well-drained, fertile soils with full sun exposure. They inherit most of the characteristics of Musa balbisiana, making them tolerant of dry soil and colder conditions of temperate climates. They require minimum rainfall and can survive long dry seasons as long as adequate irrigation is provided. However, their fruits may not ripen under such conditions. They also have good resistance against Sigatoka leaf spot diseases. The fruits are 8 to 13 cm (3.1 to 5.1 in) long and 2.5 to 5.5 cm (0.98 to 2.17 in) in diameter. Depending on the ripeness, the fruits are distinctively squarish and angular. The flesh is white and starchy, making it ideal for cooking. They are usually harvested while still green 150 to 180 days after blooming, especially if they are to be transported over long distances. The saba banana is a triploid (ABB) hybrid of the seeded bananas Musa balbisiana and Musa acuminata. 'Saba' is known in English as saba, cardaba, sweet plantain, compact banana, and papaya banana. Saba is also known by other common names such as saba, sab-a, or kardaba in Filipino; biu gedang saba in Javanese; pisang nipah or pisang abu in Malaysian; dippig in Ilocano; pisang kepok in Indonesian; kluai hin in Thai; and opo-’ulu or dippig (from Ilocano migrants) in Hawaiian. Saba bananas are part of the saba subgroup (ABB), which also includes the very similar 'cardaba' cultivar. Both were once erroneously identified as BBB polyploids, and both are used extensively in Philippine cuisine, with the latter being more popular in the Visayas and Mindanao regions. The subgroup also includes the 'Benedetta' cultivar, also known as 'Inabaniko' and 'Uht Kapakap' in Micronesia, 'Praying Hands' in Florida, and 'Ripping' in the Philippines. Saba bananas are one of the most important banana cultivars in Philippine cuisine. The fruits provide the same nutritional value as potatoes. They can be eaten raw or cooked into various traditional Filipino desserts and dishes such as maruya/sinapot, turrón, halo-halo and ginanggang. It is also popular in Indonesia, Malaysia, and Singapore in dishes like pisang aroma (similar to the Filipino turrón), pisang goreng (fried bananas), kolak pisang, and pisang kepok kukus (steamed banana). Saba is also processed into a Filipino condiment known as banana ketchup, invented by the Filipino food technologist and war heroine Maria Y. Orosa (1893–1945). The dark red inflorescence of saba (banana hearts, locally known in the Philippines as puso ng saba) are edible. The waxy, green leaves are also used as traditional wrappings of native dishes in Southeast Asia. Fibers can also be taken from the trunk and leaves and used to manufacture ropes, mats, and sacks. Saba bananas are also cultivated as ornamental plants and shade trees for their large size and showy coloration. In comparison to most other types of cooking bananas, saba bananas are highly resistant to black sigatoka (Mycosphaerella fifiensis) and are more tolerant of drought conditions and soil nutrient deficiencies. As such, they are viewed as a possible source for breeding new hybrid cultivars to replace more susceptible cooking banana cultivars grown today (in particular, the threatened East African Highland bananas). ^ FS dela Cruz Jr.; LS Gueco; OP Damasco; VC Huelgas; FM dela Cueva; TO Dizon; MLJ Sison; IG Banasihan; VO Sinohin & AB Molina, Jr. (2008). Farmers’ Handbook on Introduced and Local Banana Cultivars in the Philippines (PDF). Bioversity International. ISBN 9789719175186. ^ a b c Michel H. Porcher (May 17, 1998). "Multilingual Multiscript Plant Name Database: Sorting Musa cultivars". The University of Melbourne. Retrieved January 18, 2013. ^ L. Sequeira (1998). "Bacterial Wilt: The Missing Element in International Banana Improvement Programs". In Ph. Prior; C. Allen; J. Elphinstone. Bacterial Wilt Disease: Molecular and Ecological Aspects. Springer. p. 9. ISBN 9783540638872. ^ a b c d Biley E. Temanel (16 December 2007). "Techno-Guide for Saba Banana Production in Cagayan Valley". openacademy.ph. Retrieved 11 January 2011. ^ Koon-Hui Wang; Angela K. Kepler & Cerruti R.R. Hooks. "Brief Description of Banana Cultivars Available from the University of Hawaii Seed Program" (PDF). College of Tropical Agriculture and Human Resources, University of Hawai'i at Manoa. Retrieved June 29, 2011. ^ Randy C. Ploetz; Angela Kay Kepler; Jeff Daniells & Scot C. Nelson (2007). Banana and plantain—an overview with emphasis on Pacific island cultivars (PDF). Species Profiles for Pacific Island Agroforestry. Bioversity International. ^ P.R. Row; F.E. Rosales (1993). "Breeding Cooking Bananas for areas with Marginal Growing Conditions by using Cardaba (ABB) in Cross-Pollinations". Proceedings of the Workshop on Biotechnology Applications for Banana and Plantain Improvement held in San Jose, Costa Rica, 27-31 January, 1992. INIBAP. p. 128–136. This page was last edited on 15 December 2018, at 15:16 (UTC).